vides by a total of either 10,000 or 100,000, as selected by the software. The resulting output of U2 (pin 26) is a 1-Hz or 10-Hz signal. The counter is divided between the front-end section and a Philips HEF4534 CMOS counter, U4. U4 provides 5 decades of BCD counting, with the four bits of each decade appearing successively on the outputs of the IC. U8 provides the sixth decade, with the seventh, least-significant decade provided by either U21 or U22, in the "front end" circuit of Fig 1. One of the control-register bits (pin 6 of U12) provides a master counter-clear signal to each of the counter devices. This signal, along with the gate signal from U6, controls counter operation. Fig 2—Schematic of the PC-based counter board. Use 0.1-nF bypass capacitors (riot shown) from Vcc to ground at all IC sockets. U2—Philips HEF4750 frequency synthesizer IC. U3—74LS390 decade counter IC. U4—Philips HEF4534 5-decade frequency counter IC. U5—10-MHz oscillator (see text). U6—74LS74 dual D flip-flop IC. U7—74LS04 hex inverter IC. U8—74LS160 decade counter IC. U9,11—74LS244 octal buffer IC. U10—74LS32 quad OR gate IC. U12—74LS374 octal D latch IC. U13—74LS30 8-input NAND gate IC. U14—74LS02 quad NOR gate IC. 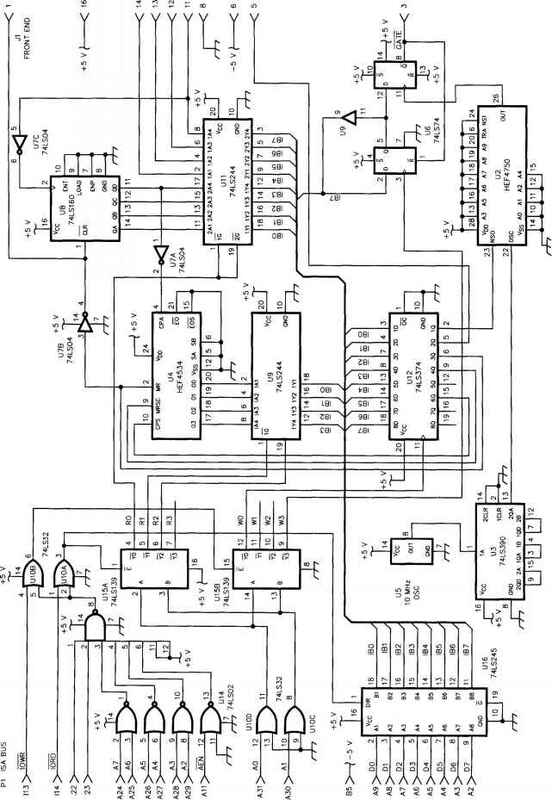 U15—74LS139 dual 4-line decoder IC. 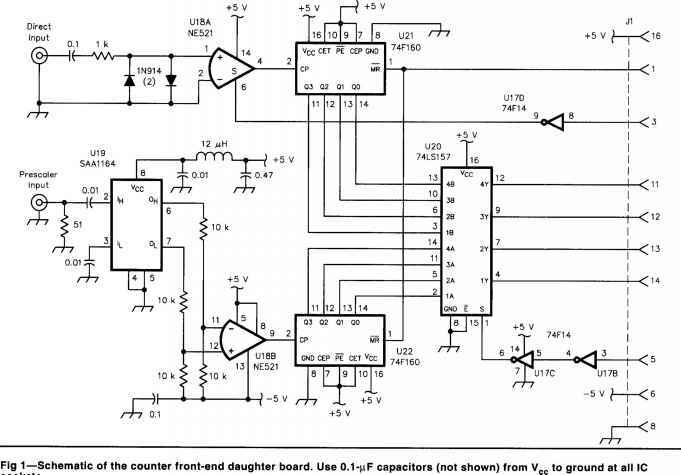 U16—74LS245 octal bus buffer IC.